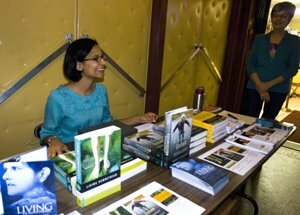 On October 29th, I was delighted to attend the Ottawa premiere of my documentary film, Living Downstream. Presented by Prevent Cancer Now, the screening attracted a large crowd to the Mayfair Theatre on Bank Street. 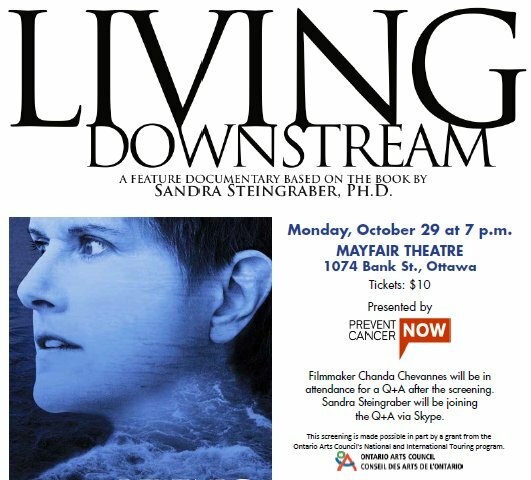 Living Downstream is based on the book of the same name written by ecologist and cancer survivor, Sandra Steingraber, PhD. Both the film and the book focus on two stories of cancer: the public and the private. In the film, we follow Sandra as she travels across North America to ring the alarm bell about the connections between cancer and the environment. We also follow Sandra into her urologist’s office, where she undergoes her regular cancer screening procedure. In this way, the film journeys from the external landscapes of farmers’ fields, remote mountaintops, and industrial towns to the interior landscapes of Sandra’s own body. 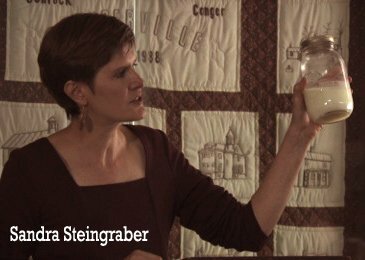 When I first read Sandra Steingraber’s book, one of the things that was most surprising to me was the way synthetic chemicals can travel. Many of us have the idea that a chemical stays where it is released. Still others believe that it goes “away.” And yet neither notion is quite right. Some amount of a substance will stay close to where it is released. For example, when an agricultural herbicide is sprayed on a farmer’s field, some portion of it will remain on our food and in the soil. But some other part of the substance will inevitably migrate. When it rains, the rainwater will carry the chemicals “away”—into our rivers and streams. As the wind blows and air temperatures increase, the chemicals will be spirited “away”—into the air, water, and soil of other communities. As a result of this perspective, the theme of travel is an important one in my documentary adaptation. In the film, we follow two toxicants — a herbicide called atrazine and the long-banned industrial chemicals known as PCBs — as they travel through our environment and enter our bodies. And we learn about some of the mechanisms by which scientists believe these chemicals may be working to cause human cancer. So, the film travels through public and personal stories as well as landscapes. It travels with the chemicals as they wander near and far. But since the film's release in 2010, I have been thinking about travel of a different kind. I’ve been thinking about the travel of film. Living Downstream has had over 200 screenings in many states throughout the US and in many Canadian provinces. It has aired on television stations around the world and has been translated into French, Spanish, Portuguese, Swedish, Serbian, and Chinese. This week’s screening in Ottawa was one stop in a four-city Canadian screening tour (made possible in part by a grant from the Ontario Arts Council’s National and International Touring Program). What I’ve learned in the years since the initial release of Living Downstream is that films — full of ideas and emotions and information — can travel just as far and wide as chemicals. Synthetic chemicals enter our bodies and once inside, they can cause us significant harm. But films can enter our minds and our hearts. And once inside, they can open us up to new ways of thinking and being. They can be a significant benefit. And that’s what I saw at the Mayfair Theatre in Ottawa. The film played well to the large audience in attendance there. But perhaps of greater impact was the Q&A session following the film. Sandra Steingraber joined us on Skype from her storm-threatened home in Upstate New York. Meg Sears, PhD, an environmental health researcher with the Children’s Hospital of Eastern Ontario and a board member of Prevent Cancer Now was present in the theatre to share her expertise and perspective. Dr. Sears reflected on the problems with our chemicals regulatory system which does not effectively address questions of toxicity on a chemical-by-chemical basis. Elizabeth May, a Member of Parliament and the leader of the Green Party of Canada, was also in attendance. Ms. May invited Sandra to comment on the differences between the Canadian Cancer Society (which takes a strong precautionary stance on environmental carcinogens such as lawn chemicals) and the American Cancer Society (which believes the scientific evidence linking cancer to synthetic chemicals has been overstated). Perhaps most movingly, towards the end of the evening, Lunda Gunn, a member of the audience, spoke a bit about her experiences in her hometown of Iqaluit and reflected on the severe chemical contamination of the Arctic and the health problems faced by her friends and family there. In response, Sandra shared a story of being so inspired by a delegation of Inuit mothers at a United Nations conference on persistent organic pollutants that she decided to circulate a jar of her own breast milk amongst delegates during her testimony on the contamination of breast milk (a scene which is described in Sandra’s book Having Faith and humbly recreated on screen in Living Downstream). When the screening ended and the audience filed out of the theatre, I felt energized. I was energized by Sandra’s eloquence; by the audience’s level of engagement; and by the passion of Judy Field, Meg Sears, and Fran Rubio — the members of Prevent Cancer Now who worked together to organize such a powerful event. The Ottawa premiere of Living Downstream helped me to see the ways in which film can enter our hearts, and our minds. It helped me to remember the ways in which film can be used to bring communities together to spark important discussions. It reminded me just how far an idea can travel.